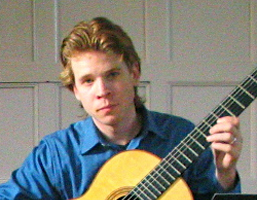 Co-founder of the Miami Guitar Trio, classical guitarist Corey Harvin has been performing in the U.S. and Japan since 1998. A winner of the Boston Classical Guitar Society Duo Competition, Corey is a collaborative musician and was a founding member of the Pedestrian Guitar Duo, a guitar duo dedicated to playing original modern repertoire. As a soloist Corey has concertized in the USA and Japan. He has also performed with vocalists, flute, saxophone, trumpet, and chamber groups including Musica Nova and OSSIA, as well as with the Tennessee Philharmonic Orchestra and Vivo Sinfonietta Orchestra of Ann Arbor, Michigan. Unusual for most classical guitarists, Corey’s most recent concert featured him playing electric guitar with the University of South Florida Percussion Ensemble for a night of World Premiere music. Harvin completed his undergraduate studies at Florida State University under Bruce Holzman and his Master’s and Doctoral work with Nicholas Goluses at the Eastman School of Music, through the University of Rochester, New York. He has participated in master classes under Grammy winning L.A. Guitar Quartet members Scott Tenant, John Dearman; lutenist, Paul O’dette; and guitarist Kevin Gallagher. Corey is currently the director of guitar studies at the Palmer Trinity School in Miami, Florida.